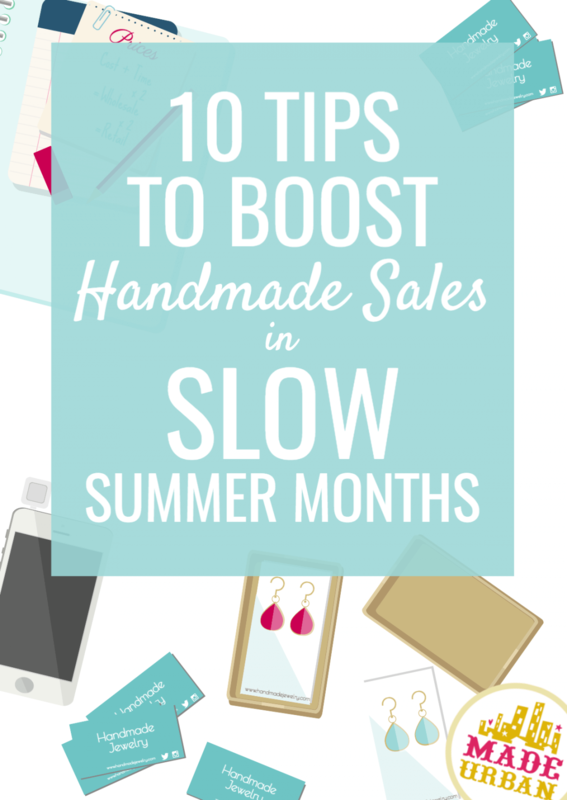 Regardless of whether your handmade business ramps up for you in the summer or the winter, every handmade business goes through a period of slow sales and these tips are here to help, whenever that strikes. The holidays are usually a great time for handmade sales with all the gift giving and dressing up for parties that goes on. So you’re not alone if you feel your sales drop as the days get warmer and longer. Who doesn’t want to be outside, enjoying the sun and eating ice cream? But we do have a business to run right? Although it’s summer here in North America, on the other side of the hemisphere, it’s winter. I know…mind blown! If your handmade products are seasonal and can travel, make some connections in Australia. Contact boutiques, email bloggers, cross promote with other handmade businesses and gain some new fans on the opposite side of the globe. If connections are hard to come by, try some paid advertising towards your new target market to see if that helps boost your handmade sales. Update your website and text to let any new visitors know that you do ship to them. Also be sure your new customers can select their country as a shipping option and that the price reflects that. The amount of craft shows that happen during the holidays are increasing every year and you can easily stay busy with an event each week. In the summer, you need to think a little more strategically to keep those handmade sales up. There are some great indoor craft shows that go on in the hotter months but generally people are taking full advantage of the nice weather and the outdoor markets and festivals. There are lots of outdoor markets, pop-ups and festivals to choose from but as I explain in more detail in my e-book, choose wisely. The craziest outdoor festival may attract every person in your city, but what are those people there for? It’s important to choose events that have a target market your handmade products will be a fit for and the potential to sell well. Just because there’s one targeted towards kid’s activities, doesn’t mean you’re going to sell out of your handmade children’s products. Kids are going to be running around checking out the clowns, getting their face painted and jumping in the bouncy castle. And guess where the moms will be? Right behind them, not leisurely shopping the selection of handmade products. Each event is different so be sure you take your time and do your research so you can be sure the event will help boost your handmade sales. For a little guidance, check out 10 RED FLAGS TO WATCH FOR WHEN APPLYING TO A CRAFT SHOW. That being said, the people who shop at outdoor farmers’ markets and festivals usually have a slightly different mindset than people shopping a holiday craft show. They’re typically not ready to drop hundreds of dollars or carry around a big or heavy item for the rest of the day. They’re out to enjoy the weather, get some good eats, pick up a few fresh groceries for the week and see what their community is producing. Tweak your existing handmade products to appeal more to the outdoor shopper. Can you make smaller, lighter, easier to carry versions of your products? Can you introduce lines that go with the theme of the market? For example: fruit & veggie themed soaps at a farmers’ market or bright colorful accessories at a Caribbean festival. Try to stay within your brand and style by adding your spin to a theme. Otherwise you risk attracting one-time customers who will struggle to find items to purchase from you in the future. You will always need to be adjusting in business so don’t be afraid to step outside your comfort zone. Even if you’ve found your rhythm within your handmade business, outside factors are always changing, which means you need to adapt. So be comfortable with changes and see them as a good thing. Just because you knit wool toques doesn’t mean you need to throw in the towel and wait for the weather to cool down to start producing, marketing and selling again. If winter sales are high enough that you need the slow sale time during summer to stock up, that’s amazing. But if you’re looking to keep some sort of income going in the warmer months, consider expanding your handmade product offering. Think of a new handmade product to introduce, pick up a new skill or find a way to reinvent your existing products to be more appropriate for the summer. You may introduce crocheted swimsuits or blankets for cabins and beach houses. Learning to sew could allow you to keep within the accessory category and make fabric hats or scarves to tie around your head. Or simply switch up the material and colors you use and make lightweight knit hats for summer. There are tons of people who make a slouchy beanie look cool in the summer. Swap your website photos of models in parkas for those in a slouchy hat, white tee and cut-offs. Don’t go too far outside your niche or force a new product. Explore some ideas to see if you can offer anything that will blend with your brand and boost sales in the slower summer months. This is one of my favorite articles, packed with ideas for when you’re looking to expand or improve your current line: DO SHOPPERS REMEMBER YOU AFTER A CRAFT FAIR? HERE’S HOW TO MAKE THEM. 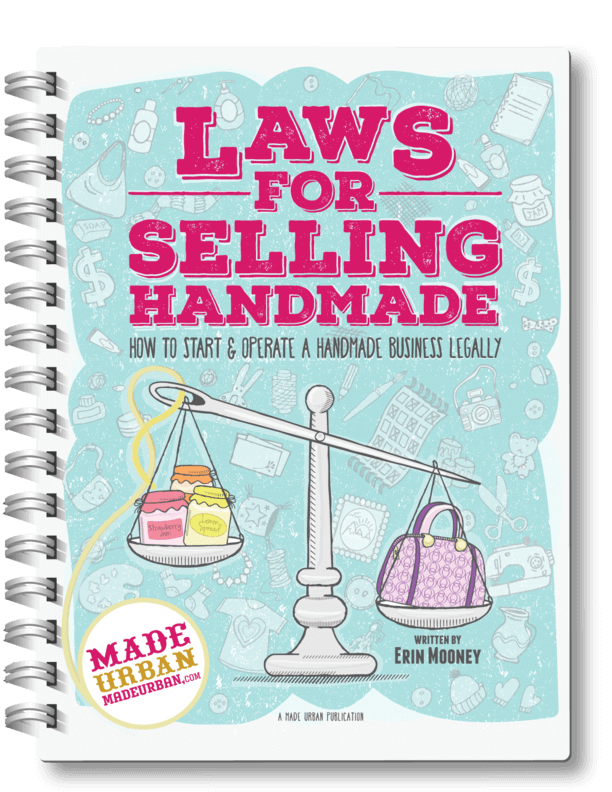 This is another good one that will get your wheels turning: 1 TRICK RETAILERS USE TO GET YOU TO BUY & HOW YOU CAN USE IT IN YOUR HANDMADE BUSINESS. You’ve undoubtedly built up some amazing skills perfecting your craft. When it comes to art or online marketing, you don’t need a certificate proving you’re an expert. Experience and growth are proof enough that you know what you’re doing. If you’re doing something other people want to do, and you’re doing it successfully, they can learn from you. Write an e-book, create a video course, teach classes or run workshops to share your knowledge and get paid for it. Take some time to brainstorm what others may consider you an “expert” in and the content you could share that people would be willing to pay for. Is it better to go silent over slow summer months because you sell winter toques or stay in people’s feeds and minds by sharing non-promotional content your ideal customer is interested in? The idea is to stay top of mind and in your shopper’s feeds. Otherwise, how can you make sales? That content may not result in immediate sales but you may gain new fans, followers or subscribers because of it. That will come in handy when you are ready to start selling again. Plus, you will have built up some trust with new fans because your posts aren’t all about selling your handmade products. They’ll see that you provide quality content and that you really get them. If you sell winter toques and your brand markets towards the outdoorsman/woman, use the summer months to speak to what they’re into now. Your ideal customer may be going out for hikes, looking for great places to visit or planning camping trips. So instead of trying to show them your warm winter hats, pivot your social media, blog or newsletter content and share things that are going to pique their interest while staying relevant. And you never know…they may need a toque to keep them warm for late night and early morning camping. Camping hacks that are lifesavers, the best hiking trails in your area or recipes for granola bars they can pack for hikes will all be really helpful to your existing followers and attract some new ones. It’s a lot easier to market to someone who’s on your list than to those who aren’t so don’t look at posts that don’t sell as wasted effort. Don’t get the wrong idea here. I’m not suggesting you drop your prices to boost your handmade sales. I am suggesting you consider running a promotion or sale to either clear out old stock or create some interest in your new stock. Keep them short and sweet. A sale that goes on all summer doesn’t urge anyone to buy. A “New fall line discounted for one week only” will encourage people to get it while the gettin’s good. If you’re barely making a profit on your handmade products, you need to first make sure you’re pricing them properly and ensuring you’re covering your overhead costs. Then look at ways to lower your costs. WHAT TO DO WHEN YOUR PRICES ARE TOO HIGH covers the different ways to lower your costs and increase your profits which will come in handy if you want to offer discounts. You could also use this time to offer custom orders. Many businesses get too busy to fill custom orders around the holidays. Everyone wants that something special for that special someone and they usually want it last minute. Educate your customers on the policies of your handmade business and make it clear that you’re only open to custom orders from the start of June to the end of August (for example) so now is the time to get them in. Sometimes they just need a little nudge or reminder to think ahead and avoid the last minute rush. If you don’t take custom orders or typically have a bunch of requests for them, consider if there’s another limited time offer you could run. These types of offers are what make Starbuck’s Pumpkin Spice Lattes off the hizzy. Everyone knows they only come around once a year so they get their fill of them while they can. Create a tradition your fans, followers and customers know to watch for each year and create some hype around it. What can you offer for a limited time that will make people feel like they need to buy, even if they can’t use it for the next few months? Consider asking a question people will be genuinely interested in knowing the answer to. What is this new handmade product going to do to improve their lives and what can you ask that will make them start racking their brains? It may not be a groundbreaking improvement but remember, people are always wondering what’s in it for them. Sales may slow down for you in the summer but they ramp up for many stores. See if you can boost handmade sales by selling your product wholesale to retailers. Most cities have an area that’s great for shopping freestanding stores. Clusters of boutiques, coffee shops and restaurants create a spot for people to get out and do some shopping, without being cooped up in a mall. That being said, for several years I was a Regional Visual Merchandiser for a major retailer, which had me working in malls year round and I can tell you; summer was busy! As soon as school was out, malls across the country filled up and got increasingly busy as “back to school” approached. It was the second busiest time of the year. So don’t ignore retailers in the mall for your consignment or wholesale accounts. If you haven’t thought about selling through retailers before, THE PROS & CONS OF SELLING HANDMADE THROUGH RETAILERS will give you a good overview and 10 STEPS TO GET YOUR HANDMADE PRODUCTS INTO BOUTIQUES will help you get there if you decide it’s a fit for you. If sales are slow and there aint nothin’ you can do about it, use this downtime to catch up all those things you’ve been meaning to do. Send thank you notes, update your website, start your blog and build up content, reach out to other businesses or organize your craft room. If you’re looking for some more ideas, have a look over Creative Hive’s list of 9 Powerful Things you can do when Business is Slow. Mei Pak delivers some really solid advice and I definitely recommend you have a look around her blog and courses. Use your efforts wisely. You can’t force people to buy or pay attention to your handmade business. Spending hundreds of hours or dollars on marketing and advertising is going to be a waste of time, money and effort if people don’t want what you’re selling right now. When the busy season comes back around, make the most of it by getting people on your lists. Newsletter subscribers are your best bet since they remain in your hands and not at the mercy of algorithm updates that cut your reach in half. But you can still make the most of your social media pages too. Do your best to get each person you encounter to put one foot in the door (liking your page, following your boards, signing up for your newsletter, etc.) in hopes that you can turn them into a full on customer down the road. Know your customers and your business. Recognize your ebbs and flows so you don’t get discouraged the same time each year. And don’t be afraid to switch things up and try something new. Slow times are the best times to test out new ideas.